World Environment Day, 2017 is coming up, and unlike most other holidays that usually include an exchange of gifts and a mass upload of lengthy messages and heart-warming photos on social media, World Environment Day is doomed to leave only a minor blip on our social calendars. There are a lot of us out there that are keen on taking impact-based action, but often we lack in ideas or the appropriate platforms to do so. Any kind of positive impact on the environment would, in any case, require a consistent, long-term commitment toward changing deeply ingrained lifestyle habits. In the climate change narrative, we often hear the term carbon footprint used. The carbon footprint of an individual, in layman’s terms, is the total amount of carbon dioxide produced by any human activity such as driving a car, consuming electricity, purchase of goods (which also leave a carbon footprint based on the manner of production) etc. By calculating your carbon footprint, you can calibrate the exact impact your daily operations have on the environment. 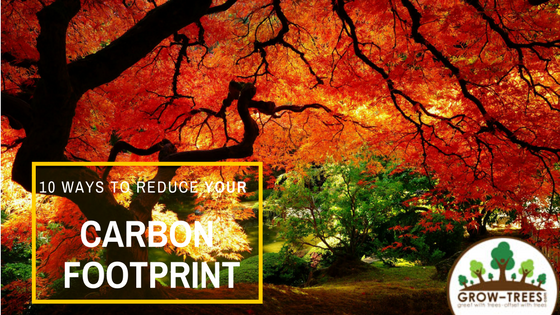 Here are a few sure shot ways to reduce your carbon footprint. 1) Keeping your cars well-maintained including your tyres, air/oil/fuel filters is an easy way to reduce your carbon footprint and extract a good mileage from your vehicle. 2) Switching to energy-conservative household fixtures such as lights, air conditioners, kitchen appliances and electronic gadgets, that consume less energy and give maximum output should be on top of your list. 3) Technology has allowed us to make communication paper-free. So, whether it be emails for work, e-books and e-newspapers for professional and/or personal use, e-wedding invites, e-tickets, etc. the option to save paper and by extension- trees is available and very well appreciated too. 4) Making a conscious decision to purchase goods from sustainable businesses, from buying organically grown fruit and vegetable produce to gifting products that are sourced from recycled materials, the options in the market today are abundant. 5) Another resource we often take for granted is food. Wasted food, when disposed of carelessly, ends up in landfills where it decomposes with other waste and releases methane into the atmosphere (a greenhouse gas). Consuming food mindfully and disposing it sensibly is essential. 6) Waste management is another key practice that has long term benefits for your local community. Waste segregation allows organic waste/recyclable to be separated from non-biodegradable waste. The organic waste from food, liquids and plants can be used as compost to enhance soil nutrition. Paper and other paper-made products can be recycled and put to similar or other creative uses. 7) Another highly effective but perhaps more labour intensive method of improving your carbon footprint is switching to renewable energy. The availability of such energy depends on a lot on where you live and local resources accessible to you. Installing solar panels in your homes to power your household needs is one such option. 8) Incorporating sensible travel routines, such as carpooling, using public transport where possible, flying with airlines that are actively working toward reducing their own carbon footprint, can contribute significantly toward reducing carbon emissions. 9) Wasting water too puts immense pressure on our natural resources. The carbon footprint to transport massive quantities of water to commercial and residential properties from natural sources also create a carbon footprint. 10) Planting trees or plants in local public spaces, and discouraging urban expansion at the cost of parks and gardens in local communities is a proactive step one can take. World Environment Day amazing, Carbon, Carbon Footprints, dandelion, dandelions, instanaturelover, kanha, kanha national park, landscape, nature, naturelovers, pench tiger reserve, tree_enthusiast, tree_love, tree_perfection, tree_shotz, treehugger, treelove, treelover, treeshunter, treestagram, vodafone India, WorldEnvironmentDay. permalink.